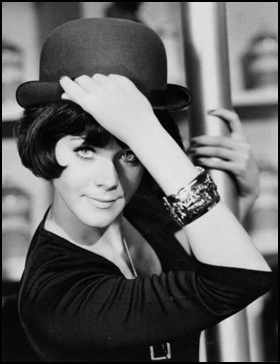 Born Linda Robinson in Toronto Canada, veteran actress Linda Thorson is best known for playing Tara King in the classic ITV series The Avengers (1968) alongside Patrick Macnee. In the ensuing years, Thorson worked on stage, film and television, including in such diverse offerings as Brian Clemens' well-regarded genre show Thriller, the action-adventure series Return of the Saint (1978), J. Lee Thompson's The Greek Tycoon (1978), and the Steven Seagal action flick Half Past Dead (2002), not to mention critically-regarded stage turns in Michael Frayn's Noises Off (1983), Wendy Wasserstein's The Sisters Rosenzweig (1995), and Peter Shaffer's Equus (2007). From 1989 to 1992, she appeared as scheming matriarch Julia Wheaton Medina in the daytime drama One Life to Live. And, lest you sci-fi geeks are beginning to feel left out, she also guest-starred in Star Trek: The Next Generation (1993), playing female Cardassian starship captain Gul Ocett. In more recent years, Thorson has enjoyed recurring roles in episodic television such as the Canadian series Emily of New Moon (1998-2000) and the long running British TV series Emmerdale (2006-2007). Not surprisingly, we sat down with Thorson to (ostensibly) discuss her memories of starring as Brooke Parsons in the cult slasher Curtains (1983). But when you're sipping tea with a RADA-trained, BAFTA award-winning legend like Thorson, it's well nigh impossible for the chat not to invariably turn into a fuller career retrospective. And happily, that's exactly what happened here. The Terror Trap: So marvelous to talk to you! 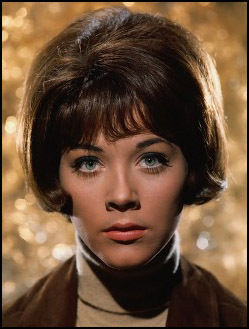 Linda Thorson: Oh, the pleasure's mine. I’m glad we could finally make it work. TT: Tell us…what’s your first memory of knowing you wanted to act? LT: Well now, that IS going a long way back because I remember it as being one of my first memories. I had this urge to stand up in front of people. It was Queen Elizabeth's coronation in 1953. I was born in 1947, so I had to have been about five. I hadn’t quite had my sixth birthday. My father had made this tiny television set. He made it in the basement with the tubes and everything. He put this little screen on it, and the wooden box it went in…and we watched the Queen's coronation. My mother was the head of the Cancer Society and so she gave a lot of cocktail parties and things. I would just bring a little stool into the center of a busy party and I would stand up on top of it and start to talk (in a British accent) very much like this. I would make pronouncements and put on a little play that I’d written in my head. Everyone sort of looked at me like I was this mad child. Well, I was! I was performing. I started skating when I was very young on Saturday nights at the Granite Club in Toronto. We would put on performances and I would do my solo. And the audience would applaud when I was finished skating. I eventually became champion of the club. TT: You must have enjoyed that. LT: Yes! That was my taste of ohh…this is what happens. You do something in front of people and they LIKE it. Then, when I was around 12 or 13, I was watching all these television programs that I absolutely loved in those days. LT: Well, Ben Casey had a huge effect on me. I thought, "I must become a neurosurgeon." (Laughs). And 77 Sunset Strip…I thought, "Oh, this is a great job!" I remember I loved the movie A Summer Place (1959) with Troy Donahue and Sandra Dee. When Troy kissed Sandra, I thought I was going to DIE! I thought, "My God…if you’re an actor, you can pretend to be all these people. And you get kissed by Troy Donahue as well!" So I went on to investigate how I could do that. I read about the Actor’s Studio in New York. And the Royal Academy of Dramatic Arts (RADA) in England…and I decided I was going to go to England. LT: Yes, the end of the story is that I DID go there when I was 16 and I got a scholarship to RADA and that was that. I thought I could have been all these professions, but I realized they were people on television I was watching and those professions were portrayed by ACTORS. So I decided I was going to be an actor. TT: Tell us about studying at RADA. LT: A dream come true. Truly. At my boarding school, because I was the tallest girl, I was in the drama department and so I got to play Shylock and all these wonderful parts in Shakespeare. You go to school and all day, you’re studying what you love. I just thought it was the best thing in the world, being at RADA. And of course, it was such a great place to go because you immediately have the Little Theatre, where even at the end of the first term, we put on scenes. TT: What else did you do there? TT: So you did “Adelaide’s Lament," eh? But I should add...in those days, we had nothing. I shared a room with a girl who was also in the class. We paid two pounds each week and we shared the bathroom with seventeen people. It was such an eye opener because I came from this beautiful house in Toronto, where we had 23 rooms and 5 bathrooms. But in life, if you never go and do these things (like live in another country or live a different way) you don’t know what it’s all about. Of course, you were with people who were interested in the same things. We would get all these standing room tickets to the National Theatre. I remember watching Olivier play Othello countless times. And Albert Finney. All these great actors who were there at the time. When I finished RADA, I was about 19. I was one of the youngest people there. TT: To have been in London in the mid 60’s during the Mod era must have been just fabulous. We're envious. LT: It was extraordinary. And perhaps I appreciated it even more than any Brit because I’d come from Canada. Plus, I was in this rarified air doing The Avengers. I remember hanging out with Mick Jagger and Paul McCartney because of it…and discovering we shared the same birthday. All of their trajectory was along the lines of where mine was happening. It was just timing and location. That reminds me…back then when I first arrived in London, they still had the last of the pea soup fogs. I remember not knowing my way around and being in Hyde Park, and suddenly it came down. You could NOT see your hand in front of your face. TT: We’ve been there and you literally have to go back inside. LT: Oh! There’s nothing else you can do. But because of your ages, you couldn’t have seen how bad it was. Everyone had terrible bronchial problems. You couldn’t see or breathe. I believe in ’66, they outlawed the coal burning fires. It’s still against the law. I ended up living in London for 20 years and it got much better. TT: So this was environmental. LT: Yes, it was exactly that. Definitely not natural. I remember, in the sixties, you would hear the horse drawn carriages coming down the street, delivering milk and dairy - but you couldn’t see them. LT: It was surreal! And quite eerie. Actually, we did an episode on The Avengers called Fog, which was about Jack the Ripper. TT: That’s a good segue. What are your memories of working on that classic series? LT: To get an opportunity like that…to go in and play the lead in the best-known television show at the time, one that had already been sold to 79 countries…well, to get to have that as your initiation into the television business? It was a gift BEYOND reason. Every aspect of the production on The Avengers: the directors, the caliber of the actors who came on the show, the sets, the scripts…everything was top notch. And I was smart enough to spend a lot of time on the set and not in my dressing room. We were there incredibly long hours, but I just wanted to immerse myself in everything that was going on. It was so busy. I was in 33 episodes, and going from set to set, and we had to meet the American airdates. But I got to work with all these TERRIFIC actors like Edward Fox and Nigel Davenport. They all wanted to come on the show. TT: How was working with Patrick Macnee? LT: An absolute gentleman. Patrick took me under his wing. And by that time...well, I think he didn’t even want to do it anymore. LT: Yes. But they threw some money at him and said that it wouldn’t be forever…just a couple more years. Patrick was just charming and delightful. The whole experience was extraordinary. However, the other side of that is it was very, very hard for me because I was shoved around by grown-up men who really nowadays would never, ever allow people to treat you that way. 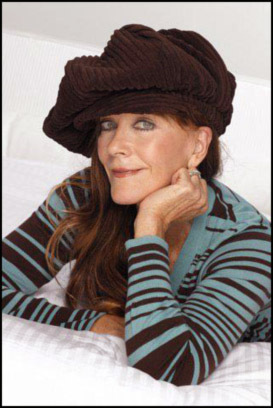 My hair was bleached blonde because although they had cast me out of 200 girls, they decided that I looked too much like Diana Rigg. Then my hair all fell out because of the treatment. LT: Yes. I had to wear wigs for about seven months. I also remember I had a stunt double who had this large bottom. And I told the producers they couldn’t use her because it didn’t even look like me. (Laughs.) She was running away from the camera and I thought, “Oh my God. That's not my bottom!” But she was terrific stunt woman and I was lucky to have her. Her name was Cyd Childs. So many nights, I would go home and cry my eyes out because I didn’t know what they wanted from me. I also didn’t want to talk to the press because I didn’t know if I’d be any good and they started to call me “Garbo.” Diana had been so huge and so loved. I filmed for a whole year before my episodes went on the air, which meant I had no idea how I’d be accepted. That was very difficult. Once the show went on the air, I was accepted and everything kind of changed for me. In a positive way. In retrospect, all the trouble seems like nothing compared to the amazing exposure we got from being on that show. When it was canceled after about 2 years, it was kind of a shock to our systems. We were slaughtered going up against Laugh-In, which was really a “water cooler” kind of show. It was kind of a backhanded compliment that we were the best competition for the other network but nevertheless, our ratings went down and they took the show off. LT: Well, I went straight back to the theatre and proved everyone wrong from RADA who thought I had sold out by going into television. Actually, there were a few big career mistakes I made around that time. I was offered a couple of Hammer horror movies right after The Avengers. LT: Yes. Ingrid Pitt was a friend of mine and she said, “Darling, you should do this.” And I told her I promised I was going back into the theatre and I meant it. Now, I realize it would have been fabulous to have a couple of those under my belt. TT: You would have been great in a Hammer horror film! Then, the other really stupid thing I did is that Dennis Selinger came to The Avengers studio one day and offered to be my agent. Dennis was Michael Caine’s agent then, although at that time Michael was a little-known actor. But for whatever reason, I didn't connect with Dennis. And so I passed on the offer. Of course, he was the most powerful agent in the world. So I admit I’ve sometimes not been smart enough about those things. Dennis has passed now. But he was wonderful for Michael and he would have been wonderful for me. Then again, I probably wouldn’t have gone back to the theatre…which I still do to this day. I do love going on stage. You’re much more in control of what’s going on. TT: Which do you prefer, stage or film? LT: Stage. The money can be great on a movie, it's true. And once in a while, you’re going to do a film that you just feel so happy to be a part of. I made a Steven Seagal film -- and being in Berlin was great -- but it doesn’t do anything for your soul. TT: How did Curtains come your way? 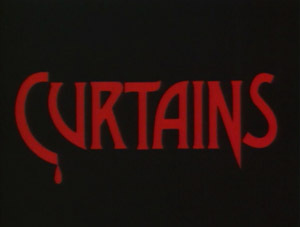 LT: Well, Curtains was going to be shot in Toronto and as you well know, there were several female parts up for grabs. I think they literally looked in the Canadian Spotlight, the casting magazine. I was hot property at the time because I was this Canadian actress who had taken over the lead in The Avengers. I was called and asked to go to Toronto and do it. I don’t even remember auditioning for Curtains, honestly. I believe it was like, "Do you want to come and do this thing?" So it was more about the invitation from them for me to do it, rather than a formal audition process. I was living in London at the time, and I asked my agent what the story was about. She said, “Well, basically it’s Agatha Christie's Ten Little Indians. But with some adult actresses fighting for a stage role." So I was okay with that. 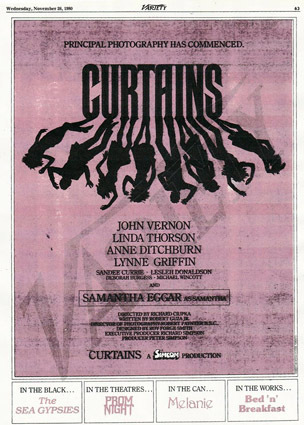 Plus, Curtains was a chance for me to work back in Toronto. They flew me back over to Canada. I met John Vernon, who was wonderful. He embraced me and eventually, I ended up spending quite a bit of time with him and his wife Nancy in Somerhill Gardens. Their daughter Kate is a wonderful actress. I'm still close with both Nancy and Kate. TT: Did you meet the other actors in the cast right away? LT: (Pauses.) Well, of course I met somebody who was to become one of my closest and dearest friends, and still is…the beautiful Samantha Eggar. They had brought Sam in as well. She’s ten years older than I and of course, was very well-known at that time. She’d been nominated for an Academy Award for Best Actress for The Collector (1965) with Terence Stamp. TT: Yes indeed. Almost a prototype for Thomas Harris' Silence of the Lambs. LT: Oh, yes! So much so. You’re right. I remember when I met Sam on the set of Curtains, I was immediately reminded of this memory from the '60s. Back then, there were three channels in England: BBC1, BBC2 and ITV. ITV didn’t start until 5:00 PM, and there was no daytime television programming when I moved there. So, the test pattern all day when color came in...was this color still of the face of Samantha Eggar. LT: Yes. And Sam had that striking red hair and green eyes and the freckles and pink skin. So they used her as the color test image, and you could use her to correct your color instead of having the color bars. You corrected your color according to Samantha’s face! So anyway, we became fast friends on Curtains. And the other actress with dark, curly hair -- Lynne Griffin -- she was terrific. Because as you may know, fur coats are wonderful in Canada. And so off we went and she bought this white, floor-length mink coat. Now understand me, I know that's not politically correct, of course. But honestly, in those days nothing was politically correct. And in some ways, I have to say things were a bit more fun, more relaxed back then because of that lack of self-consciousness. Anyway, it was summertime and Sam insisted on wearing the mink all the way back home. We were all staying at a hotel called The Sutton Place Hotel, which was the movie hotel in Toronto. Across the street was Bistro 999, where all the film people went to dinner. TT: Tell us a little more about John Vernon. LT: I became very close friends with him and his family. John died in 2005 and he wasn’t that old. Around 72, I believe. TT: Correct. He was so revered in the Canadian film world. LT: Oh, he really was. And a wonderfully nice man. A great guy. He took care of all of us on the film. He wasn't unlike Patrick Macnee in that regard. He was that kind of guy. A real gentleman. When you became a part of their show, people like Patrick, like John, made sure you were doing okay. John was very generous. He took us out to dinner each night. I mean, we had a lot of fun filming Curtains. And it was all done with a pretty reasonable budget. It looks pretty good for what it is, don't you think? Let's talk a little about your character, Brooke. Brooke is actually a good role for this kind of film. Because out of the six actresses vying for the coveted part of Stryker's Audra, Brooke is the one who has experience. Samantha Sherwood is clearly not Stryker's pick. And the other actresses lack the gravitas needed to carry off the heavy-duty role. Did you feel the role of Brooke had a little more meat on its bones than some of the other parts? LT: Yes. I did. I hate to say this -- and I certainly don't want it taken the wrong way -- but I think in my audacity back then…having starred in The Avengers, I just thought that was exactly as it should be. TT: So here's the $64 million dollar question: had she not been killed, would Brooke have gotten the role of Audra? LT: Of course she would have, darlings! Was there ever any doubt? (Laughs). TT: Yes. The director, Jonathan Stryker, thinks she’s too old for the part and so he invites all the ingénues to audition for the role. LT: Sure. So it wasn’t as if Sam and I were in direct competition. TT: And you mentioned you struck up a great friendship with Samantha? LT: Absolutely. And we still are. I go and stay with her in L.A., and she comes and stays with me in New York. Her daughter is just a wonderful actress who also lives in New York. TT: Now, the part of Brooke was originally cast to Celine Lomez. In our interview with Peter Simpson, he mentioned that a few scenes were even shot with Lomez in the role. But according to Peter, he was ultimately left with the job of finding a real actress to play the part of Brooke. 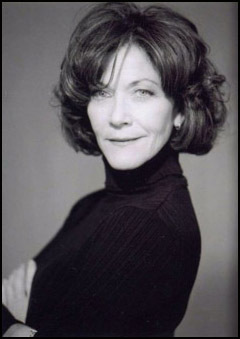 Enter Linda Thorson. LT: You know, this is the first time I've ever heard of any of this! About Celine Lomez, I mean. I suppose that could have all happened before I got there. But no, I wasn't aware of it at the time.